Dan mentioned (while submitting his upcoming review) that there didn’t seem to be feedback as to whether the submission went through. There was a small green box that shows up under the submission form with confirmation text, but it was showing up below the huge block of explanation/small print – making it easy to miss. I moved the confirmation up above the block of explanation text, so it should now show up right under the “send” button. Thanks Dan! Another quick note about reviews – a few of you guys have been submitting a lot and I’m insanely excited and thankful about that. I’m going to try and figure out some way to highlight reviewers with an author list, or something. I’ll figure that out and where to put it soon. I’m also working on some user profile / user listing tweaks/additions as suggested, but it’s kind of half assed until I finish with the marvel books. Hard to switch from the three modes – Data Entry / Programming / Writing. Still mainly in Data Entry right now, but I’ll flip the toggle on my positronic brain soon. Oh, by the way, a bit of a Deal Feature as my pal Anthony (who I’ve gotten a few hundred of my dc books from) has posted some new stuff up on ebay. Right now it’s just DC Archives, but he even lowered his price to 22.99 now. I’ve already got all the books I need/can afford, but figured you might be interested! I’ll list all the updates below here – there’s gonna be a lot! These will just be in the order they are added to the offline database. If no thanks/source is listed, I found the book via Amazon browsing or recommendation. It took a couple days to find all these stragglers, but I honestly think we must be very close now to having a complete list! 16. Marvel Masters: The Art of John Romita Sr.
17. Marvel Masters: The Art of John Romita Jr.
19. Marvel Masters: The Tales of Kurt Busiek & The Art of John Romita Sr. & John Romita Jr.
57. Assembled! 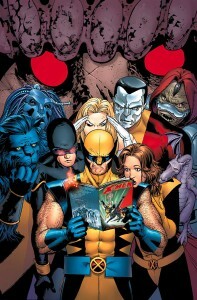 : Five Decades of Earth’s Mightiest Unauthorized Opinions, Analysis, and More! 117. Super Hero Squad: Hero Up! I also found a bunch more with some more Amazon Recommendations. Now I’ve also got to add these to the main list in the previous blog post. But I’ve also made a lot of deletions and title fixes, mainly with Marc’s help. So I’m just gonna wait until I’ve got all the books in and re-export the whole thing. Finally, there is a TON of Transformers. Thanks to Ryard for reminding me about Transformers, and their Marvel U roots and tie ins. Oh dear, do we have to add them all now? Just like the Conan books or the Vertigo books on the DC list, they started out in marvel continuity, but only 14 out of 100 or so books are in the Marvel U. I haven’t quite decided what to do with these yet. You can view our discussion in this thread. I’ll include a little poll at the bottom – let me know what you think. I would go with a separate list for the Transformers series due to fact I am interested in collecting it and do my very best to avoid Marvel at all costs! Just submitted another review for you as well, taking my tally up to 5 in two days! When there is more work to avoid being done, I am likely to write a fair few in one go again. You obviously have been very busy recently with updating the site and hopefully these reviews will help ensure that you can afford to take your time to get the Marvel list perfect. Very excited to see the list once it is up, as Steve Perry once sang “Don’t stop believin”. haha, thanks Simon. I’m leaning towards a separate list as well – it would allow me to really finesse it, which, since through several publishers, animated and movie continuities, it probably needs! Yeah, totally voted for a specialized Transformers section…or even a Hasbro section that could also include G.I. Joe. Not sure what you mean by that…the original G.I. Joe vs Transformers, while questionably in the Joe universe, was definitively in the Transformers one (with Bumblebee upgrading to Goldbug). But then the issue of was it in the official Joe universe was answered when events in the later issues of G.I. Joe led directly into the Generation Two series (Destro’s transforming castle was mistaken for a Decepticon. Makes perfect sense). While the Marvel Transformers continuity ended with Generation Two, the Joe continuity was continued by Devil’s Due, and has been re-continued (ignoring, as far as I can tell, Devil’s Due continuation stories but not their origin stories) by IDW’s Real American Hero series. And do NOT get me started on the Action Force issues. The Devil’s Due/Dreamwave Joe/Transformers were their own thing though, yeah. And God help me I shouldn’t know that off the top of my head. I need help. It’s possible I was misinformed or wherever I read it was only referring to the devil’s due stuff. It seems all three trades here were published by Devil’s Due? hahah I think I’ll be consulting you when/if we get around to our hasbro/transformers/little play toys list. Would it be possible to include just the Marvel issues of Transformers on the Marvel list (i.e., the “Classic Transformers” trades)? Or does it have to be all Marvel or all separate? What’s keeping me from just going ahead and doing that is that we’d have to have separate database entries for all 14 of those books. So that means 14 duplicate entries. I dunno.. maybe that’s less of a big deal than I think, but I could see it confusing people who are just searching for books to add to their collections, etc. It’s already kind of a problem with some lists. The main problem is that I can’t give things two different sort values, and the lists all technically are going to start overlapping. In “time” actually, if that makes it any easier to understand, since each book is assigned a date value to sort it. I don’t know, I probably should have been bright enough to figure out some way to give each book a separate sort value for separate lists and have each list simply display by that list’s sort value system, but I had no idea the site was going to get this complex when I originally came up with the system. Y2K style issue, haha. In that case, I’d say leave Transformers out of the Marvel list for now. I kind of feel the same way about Conan and G.I. Joe, honestly. It doesn’t make much sense (to me) to have, for example, some random Cobra Commander miniseries listed right alongside New Avengers. None of those series ever affected Marvel continuity in a major way, and any issues in which they actually interacted with Marvel characters are unlikely to ever be reprinted again. If you eventually find a way to include them on more than one list, though, you could always add the Marvel series back in. I don’t know why I feel like I should leave all the conan stuff in. My gut is telling me it’s more a part of the marvel u, but maybe I should just put it on a separate list. You’re right that it doesn’t interact too too much. Transformers and Joe, yeah…I actually tend to agree about leaving them out, since they aren’t really part of the MU proper, Transformers/New Aventers notwithstanding. However, the Marvel Conan, and ESPECIALLY Red Sonja are Marvel Universe canon, even if they’ll never be able to mention those characters by name again. I doubt we’ll ever see Conan-specific stuff again, but Kulan Gath appeared in the Marvel Universe in past decade, not to mention the Sonja/Spidey crossover. The last time I can recall a Conan appearance in Marvel was Atlantis Attacks, I think. Oh, maybe Conan-Rune, I suppose. Car Tire Change We’re a bunch of volunteers and beginning a new program in your neighborhood. Your site presented us having handy info to function with. You must have done some sort of challenging method as well as our own full area could be relieved for you. encourage continue your great writing, have a nice day! design my own blog and would like to find out where u goot this from.